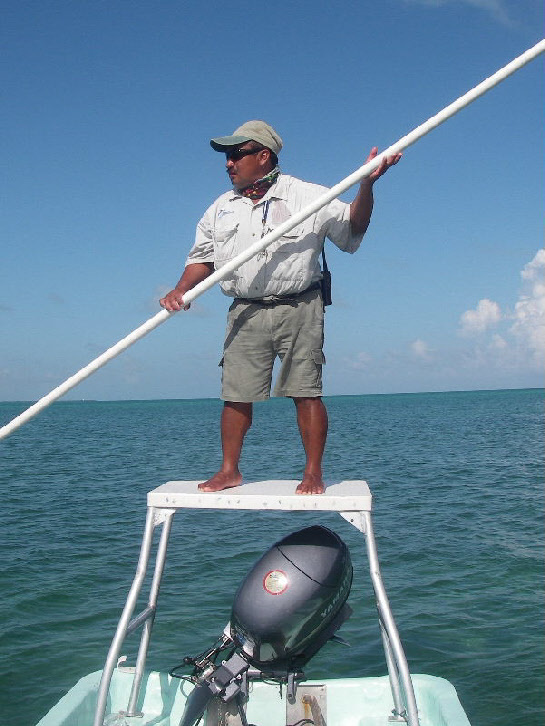 The day dawned like any other, the alarm went off at 0530, and I raised myself wearily from the hotel bed – we were staying 14 days at the Grand Sirenis hotel on the Riviera Maya for a Christmas holiday, and this day, the 28th December, was to be the last of four days fishing in Ascension bay. 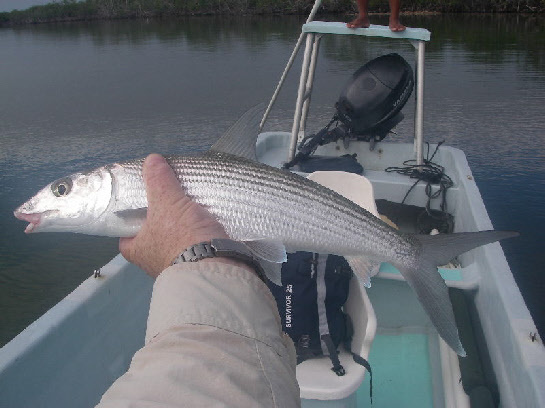 The previous days had been reasonably successful without being special, a good number of bonefish of varying sizes, together with a few unsuccessful shots at Permit, several hours seeking rolling Tarpon without much action, and even a sighting of a few decent Snook on the previous very cold day when little else was to be seen except the occasional larger then usual bonefish. I went through the usual process of preparing for the day; ablutions, getting dressed, checking the haversack and mounting the rod tubes like grenade launchers on each side, pocketing some money, stuffing a banana down my throat and putting the Sian’Khan biosphere fishing licence around my wrist (a whole $2 or 20 pesos – I bought one for each days fishing in advance on my first day at the main gate - saves waking the guard at 6am) – a quick peck for my wife Julie which bought forth a grudging ‘have a nice day’ and I was out of the door heading for the car park and my rented Jeep. The drive to Punta Allen has improved drastically since the first time I went in 2001 – the seafront road from Tulum to the entrance gates now has a proliferation of ‘eco-resorts’ and small hotels along its length, and has mostly been black topped, although ‘Topes’ or speed bumps ensure that you cant maintain a steady speed for long. The entrance gates to the Sian’Khan reserve loom about 10k after Tulum, and you are supposed to stop and purchase your licence here – if you are fishing at a lodge they will provide one but as I had booked direct with my guide I had to buy my own. From the gates to the Boca Paila bridge the road has good and bad patches – in places it is bone jarringly rough and a jeep is a definite advantage – in others a speed of 60k can be maintained, if you keep your wits about you on the single track road with blind corners. The new bridge was a revelation- those of you who have visited the area in the past or read my 2001 report will have heard of or experienced the rickety wooden bridge that was being repaired then and took some courage just to cross in a car – but now the lagoon is crossed by a new concrete two lane bridge in perfect order. The real improvement is to the road from here on in – there are a few bad patches but most of the road from the bridge to about 5km short of Punta Allen has been graded and is in excellent condition; I was cautioned by the guide about driving too fast as there had been a death on the road last year – its so smooth that it encourages you to drive too fast on the sandy slippery surface which can easily catch out the unwary – a couple of times I did a Colin McRae slide around a sharp corner and was grateful there was no traffic coming the other way. The last 5k is the same old road you know and love – smattered with two foot deep potholes full of mud slurry – no chance of getting the car there and back clean! The drive took about 1h 35minutes from the hotel to the dock at Punta Allen - a total distance of about 90k, a far cry from the 2.5-3 hours of the past and short enough to be a realistic day trip- it’s a 12 hour day but you get a decent night in your hotel to compensate. ‘Pancho’ was waiting at the dock cheerily – that’s his nickname – and we loaded the gear and set off – ‘Permit all day’ was his first question ‘Iles Tres Marias?’ – I thought about it for a minute or too – it was a glorious day without a cloud in the sky, but I found myself drawn to having another look for the snook we had failed to catch the previous morning – there were some nice fish under the mangroves and I wanted another go – Pancho nodded and we set off to the West for a short run to the place they had been lying. We arrived 20 minutes later and it was obvious I had made a bad choice – the water was a few inches lower and the temperature had risen by 5 degrees or more and there was no sign of the Snook, or the large bonefish that had been here in the cold overcast morning of yesterday– we could hear the snook crashing about behind the mangrove screen and I knew we wouldn’t see them in the open water– that’s fishing. We poled along the shore and I caught a few small/medium bones, but the low sun and clear water made them very spooky – just the flash of the line in the air was enough for the schools to spook and I could see it was going to be a tough day until the sun got higher and we stopped throwing long shadows. We moved on after an hour or so – heading East towards a spot where we had seen some permit the previous week – we poled along the north shore past the lighthouse on Snake island but it was deathly quiet – no Permit school and no rolling Tarpon – nothing but the sun sparkling from the ripples on the surface of a placid sea and an occasional curious Turtle - time for another move – Pancho pulled the starter chord on the four stroke Yamaha and we started our journey to the South side of the bay – 30 minutes later we slowed in about 8 feet of water and Pancho began scanning the horizon for signs of life – it didn’t take long before we saw some Tarpon rolling in the distance and headed over under pole power – Using the engine to approach is a sure way to send the fish scurrying off to the deeps for the day. 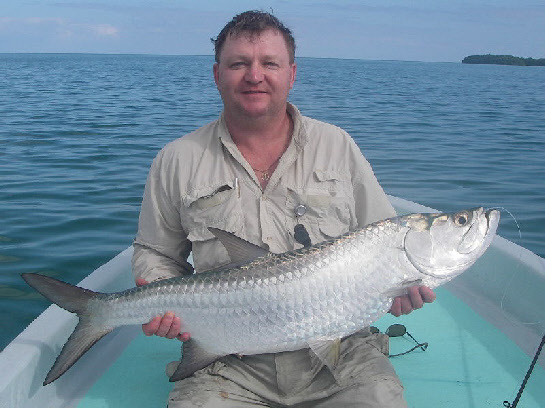 I had set up two 9 weights – a Redington TSF 9094 with a Litespeed 3.5 and a 10 weight SA clear intermediate for the Tarpon, and a Sage TCR 990-4 with the same reel and an SA WF9F saltwater line – the tarpon rod got a standard medium tarpon rig – 7 feet of 30lb Amnesia with 3 feet of 60 lb Flouro tippet and a Bunny Black Death, and the Permit rig was a 9 foot 12lb tapered leader with an additional 3 feet of 12lb FM Flouro attached and a Wills Skettel. 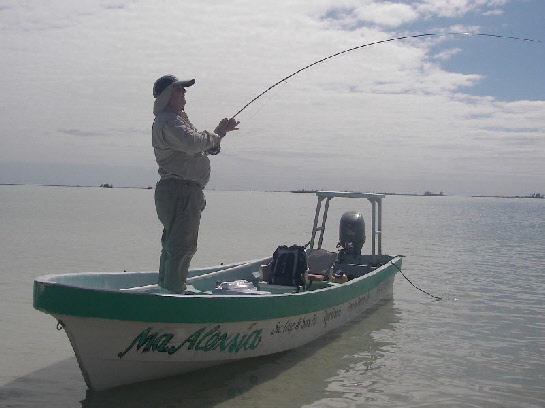 I started out with the tarpon rig – the tarpon were rolling occasionally but diving down almost vertically and obviously feeding on something near the bottom – several casts produced no response, and then a school of small Permit swam past, one chased the Tarpon fly and I decided to switch rods. 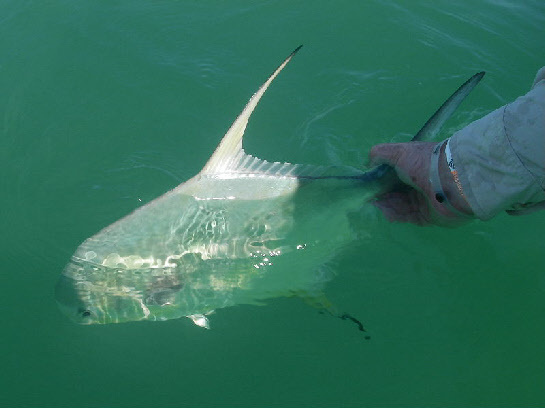 We had several shots at the Permit, lots of follows but no eating – they are so infuriating - every night at the lodge the previous week the anglers were commenting on their inability to get them to eat the fly – there were more Permit to be seen this time than I have seen in the past in Ascension Bay but they were just as spooky as ever. Pancho tipped out my fly box and we tried lots of different crabs and shrimps – eventually the line tightened on a 2/0 flexo-crab that I tied and the fight was on – at last! 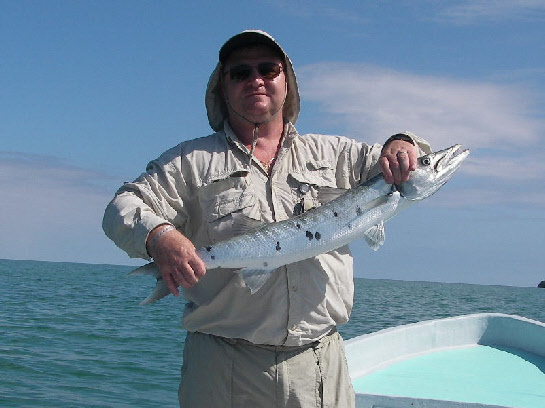 A tough battle followed – deep down, strong runs, then a barracuda ran past the boat – what!! 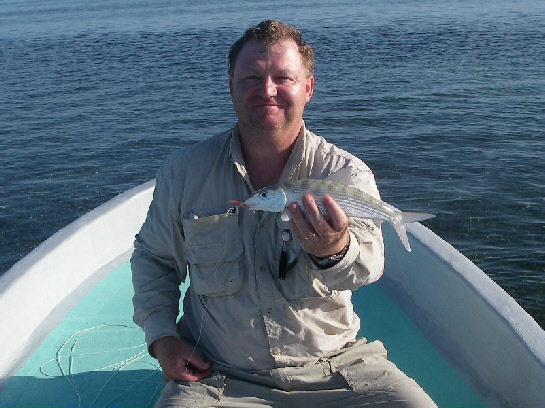 – Pancho was astonished – in 16 years he has never seen a barracuda take a crab fly – a bit of a let down, but a nice fish - I enjoyed the fight and I eventually landed the fish on a 12lb tippet – no wire but nicely lip hooked – the tippet had a number of fine curly shavings but held out – Pancho was pleased when he landed the fish as he had mentioned wanting to catch a barracuda on the way home for a special dinner with his daughter that evening. Back to the drawing board – sit down, change the tippet, stare at the crabs again and pick another – Pancho pulled out his own box and rummaged around for a while- then handed me a pink/orange shrimp fly with rubber legs – everything in Ascension Bay seems to like flies with rubber legs – in fact, without them its tough to even get a follow – I tied it on and the game resumed – get into the path of the Permit school, wait, cast and let the fly sink, long slow strip then jiggle it about and try anything you like to make them want to eat it – three or flour casts later one of the permit followed the fly and nosed up to it as they had been doing all day, then suddenly it was gone – he ate it, I struck with my left hand and he was on – yee-ha. The fight was tense as it always is with Permit - a few runs and a lot of slogging it out, but the TCR has lots of power and the drag on the Litespeed gave line smoothly when necessary . – the fish came to the boat several times before Pancho finally took the leader, lent over and lifted the fish in by the tail – yeah baby, yeah – my second Permit – I was just so pleased – not huge but bigger than my first, maybe 7 or 8 lbs – we took several pictures and then I held the fish in the water until he kicked and then waved him goodbye as he swam strongly back to his school. Back to the drawing board – sit down, change the tippet, stare at the crabs again and pick another – Pancho pulled out his own box and rummaged around for a while- then handed me a pink/orange shrimp fly with rubber legs – everything in Ascension Bay seems to like flies with rubber legs – in fact, without them its tough to even get a follow – I tied it on and the game resumed – get into the path of the Permit school, wait, cast and let the fly sink, long slow strip then jiggle it about and try anything you like to make them want to eat it – three or flour casts later one of the permit followed the fly and nosed up to it as they had been doing all day, then suddenly it was gone – he ate it, I struck with my left hand and he was on – yee-ha. The fight was tense as it always is with Permit - a few runs and a lot of slogging it out, but the TCR has lots of power and the drag on the Litespeed gave line smoothly when necessary. 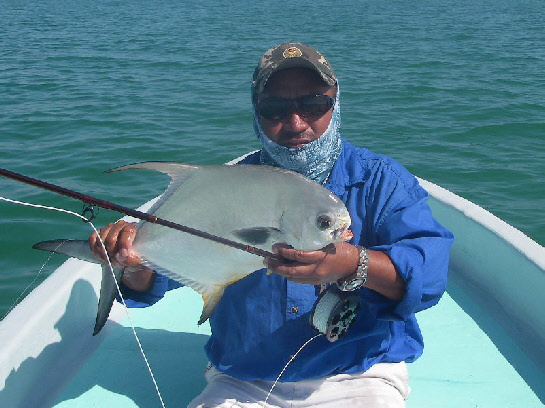 The fish came to the boat several times before Pancho finally took the leader, lent over and lifted the fish in by the tail – yeah baby, yeah – my second Permit – I was just so pleased – not huge but bigger than my first, maybe 7 or 8 lbs – we took several pictures and then I held the fish in the water until he kicked and then waved him goodbye as he swam strongly back to his school. A couple of high fives and a bit of whooping and we moved away from the fish and dropped the anchor for lunch – time to sit down, drink a soda and eat the standard issue Ham, Cheese and salad rolls – does any lodge in the world have anything different to Ham and Cheese or Tuna? Pancho pulled out the jalapenos and we added some spice to lunch – a splash caught our attention and three tarpon rolled about 100 yards away –a massive turtle stuck his nose out and stared at us, I reached for my camera and he was gone in a huge swirl – what a place – an 8 foot shark drifted past effortlessly a few moments later– Pancho asked if I would like to catch it but the Tarpon had caught my attention – my brain was telling me that this just might be the day for a slam – we had the permit and bonefish, and Tarpon were close by – maybe, just maybe…..
Pancho distracted me with a shark tale of his own – he mentioned that although he was a lobster diver by profession he hated being in the water with sharks – a few weeks earlier an huge hammerhead had drifted past overhead when he was down on the bottom working the traps and he had to hide for while before being able to get safely back to the boat – he didn’t dive any more that day! 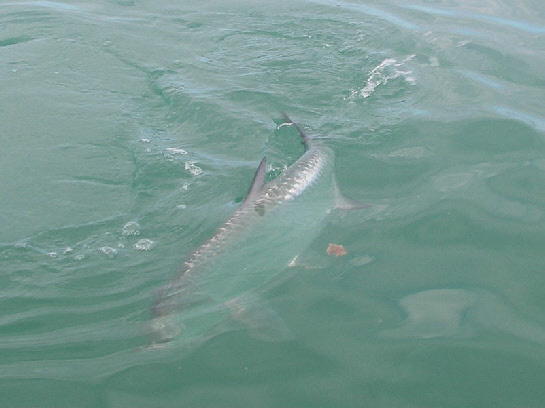 The tension was palpable as we munched and drank – every now and then a splash in the distance reminded us that the Tarpon were still around, could I get one to eat, hook it even? Get it to the boat and achieve the Slam? So many Tarpon are jumped for everyone that gets landed the odds were long, but at least the fish were around and eating something, this might be the best chance I ever got. 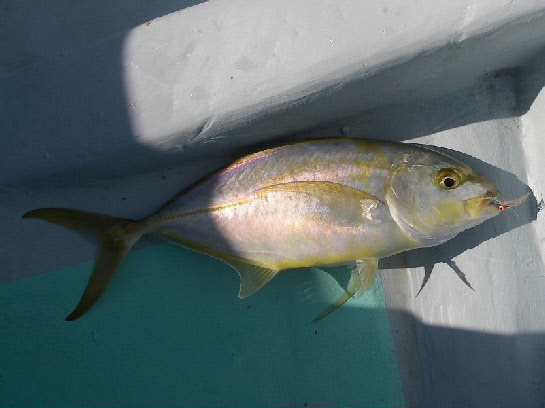 We poled off again – lunch was short and we headed over towards the Tarpon again, circling and jumping around an undersea spring in the strange eco-system that is the Sian’ Khan, freshwater bubbling through the limestone miles out to sea and mixing at the mouth of an underwater tunnel or Cenote. I began casting again, waiting for the fish to roll then trying to cast ahead of them, wait for the fly to sink – strip, strip, strip, but little happened – a pull and a light take, and a barracuda swam into view – I changed fly several times – how about a Toad –favourite fly of renowned Tarpon angler Andy Mills – no interest, then a take, strip strike hard, some weight, then nothing – again a little later on a white lightning – but still no connection – this wasn’t turning out to be easy. 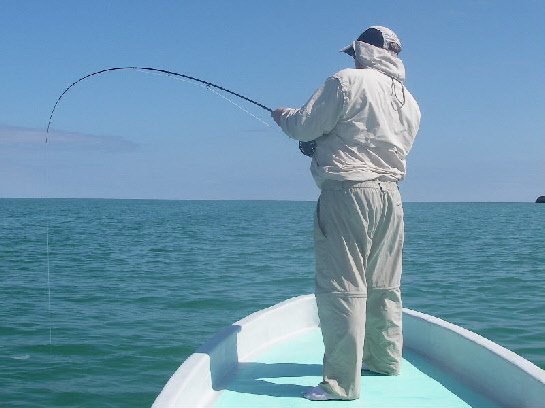 For more than an hour I changed flies, followed the school, cast, tried different retrieves, changed the sinking times, nothing – then suddenly I saw a silver flash deep in the water as a Tarpon appeared from the depths and a huge mouth engulfed the fly, I struck hard three times and the line drew tight as the water erupted – fish on! The green and white deceiver on a 1/0 hook found a home in the tip of the jaw and I bowed to the fish, it responded by stripping 60 yards of line from me and jumping three times more –I piled on the pressure to turn the fish from the coral below and Pancho poled us away from the rocks to a deeper area with less snags – I love this bit – the fish continued to run and jump, but shorter runs now, then circling around the boat, under and around, a half jump and some head shaking – I was pulling hard and Pancho reminded me that this was a small hook so I eased off a bit – all I could think was ‘please don’t come off’ – I thought of how I had bent a 4/0 at 90° in Belize last summer in a medium Tarpon - ‘please don’t come off’. Pancho grabbed the leader, but the fish tore off again and he let go quickly – I eased the drag a little and applied rim pressure to the reel – we tried to get some shots of the fish jumping, but mostly got swirls where the fish had been or empty sea – but eventually the fish came to hand – Pancho tried to lift it in by the jaw, but it didn’t want to play – so he leant over the side, cradled it in both arms and lifted it in – I was speechless- such a beautiful clean shiny tarpon, and a good size for Ascension Bay, And the Grand Slam too. We were dancing around, yelling for joy and high-fiving each other – wow, we did it; now calm down, take some pictures and slip the fish back, then sit down and let it sink in – it was quiet for a few minutes as we realised what we had achieved – something Pancho had only seen three times before so hardly an everyday occurrence. The rest of the day was an anti-climax – I decided to go looking for some bigger bonefish for the rest of the afternoon – which wasn’t very successful – I had a few small ones and a few jacks and snappers, but with hindsight we probably should have stayed on the tarpon and tried for another, or even hunted Permit again – but really we could have packed up when the Tarpon was returned and I would have been happy. Last fish of the trip - small but welcome. I had three good days fishing with Pancho, and one great day – we returned to the harbour and I settled up, and then gave him my bonefish reel - he wanted to buy the Shimano Biocraft from me on the first day but I told him it could be his tip if he wanted to guide me for the four days and he agreed so we were both happy. Pancho has guided British anglers before and is a fan of FM fluorocarbon so I gave him a spool as he can’t get it in Mexico, and I let him have a roam through my fly boxes and take a few before I left – we shook hands again and I set off back to the hotel in a state of euphoria – did that really happen today? When we set out that morning, looking for Snook and they weren’t there I think we both thought that the day had gone off track, and we had missed the chance to roam far and wide after Permit; it just shows that you never know how the day will turn out, or what opportunities will come along with a guide who keeps trying – you just have to have the gear to meet the challenge and be ready when the fish show – after that hope they eat the fly and stay hooked. 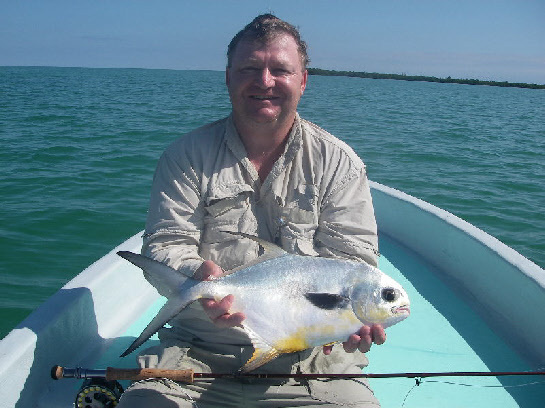 Mexico is a great place for a family holiday, the fishing opportunities are endless, and prices are attractive with the dollar weak – my fishing was actually cheaper than in 2001 – at nearly $2 to the pound it’s a great time to go. I was also lucky with the weather this time – I have had lots of windy days in the past, even a hurricane last year – this time there were days that it blew 20+knots – they just weren’t the days I fished – about time I got some luck with the weather. Tight Lines.